Most people say that history began 10,000 years ago, when humans began writing things down. If Ancient Aliens is to be believed, we were all grunting, stupid apes prior to that. The former is a reasonable guess. The latter is little more than snake oil meant to sell books and advertising on the History Channel. 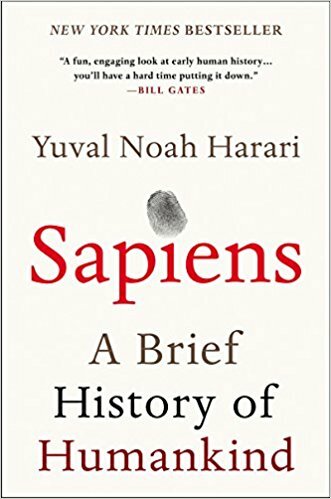 But historian Yuval Noah Harari suggests history actually began 70,000 years ago, when an unremarkable primate we now call Homo sapiens underwent what he terms “the cognitive revolution.” To Harari, this explains why other humans – Neanderthals, Dinosevians, and so on – no longer walk among us. Something changed in the brains of the sole remaining human species that allowed it to leap frog its way up the food chain and spread out across the world. The change was the ability to create fiction. Mythmaking. And while many profess that they have no need of religion, Harari suggests this is self delusion. To illustrate, he explains that the car company Peugeot does not really exist. Nor does the United States, human rights, or much anything else we take for granted. Peugeot (or you can take GM, Tesla, Toyota. In fact, any large or small corporation will do.) is not its employees. If the employees all quit tomorrow, Peugeot could simply replace them with new workers or robots. The company is not its cars. If every Peugeot car in existence were scrapped in a day, Peugeot would simply build new cars. Peugeot is not its management. If Peugeot’s management all resigned or were killed or sent to prison, stockholders and employees would simply hire new management. In fact, the only way for Peugeot to cease to exist is if either the stockholders and management dissolve the company or the courts, for whatever reason, order it to disband. Peugeot is a collective fiction designed to facilitate the building of cars. Neanderthals could not do that. Humans can. They do it with everything from corporations to religion to nation states to concepts like rights and property, and especially money. None of these things exist in reality, and yet they do. Because we all agree that they do. This, Harari posits, is what makes Homo sapiens special. He divides the history of the species into three revolutions: The first is the cognitive, in which humans learned to gossip, trade, tell stories, and create ideas that made bands of hunter-gatherers something more than a collection of hominids roving in highly intelligent packs. The second is the agricultural revolution, in which humans found it more efficient to pen in animals and grow crops in fields. This gave rise to empires, money, writing, and cities. The last is the scientific revolution, and it explains why a backwater continent like Europe was suddenly able to conquer the world. Modern commerce, complex technology, and the computer age arose from this. ﻿ Harari says that one should not consider one age better than the other. For instance, hunter-gatherers actually worked fewer hours to survive than most modern humans. And because the only animals they lived with domestically were dogs, they were less prone to disease than we would be later. But we also were not an apex predator quite yet. The agricultural revolution found humans more self-sufficient and safer from predators. And one need only watch an episode of Game of Thrones to see how irrelevant the average empire was to the life of a peasant, who could grow his own food. But it also made us dependent on limited food sources and put is in close proximity with livestock that could transmit diseases that, before and since, were not much of an issue for us. And the scientific revolution, while ultimately reducing violence (you’re more likely to commit suicide or get hit by a car than die in a war or be murdered today), disease, and starvation, also has wrecked the environment. And humans, despite their adaptability, have a tendency to drive large mammals to extinction. We haven’t been killing off every animal on the planet, but hunter-gatherers wiped out the mastodon and giant sloth, and right now, the only animals that seem to be thriving are microbes, domestic pets, and livestock and poultry. Harari’s conclusion is that humans’ ability to think and adapt is amazing, but it also has caused changes in our species that evolution cannot keep up with. We’ve not had time to get our DNA out of the African savanna, and that has consequences, both good and bad.